Charles Derain is currently the owner of Nomad wine importer and carries on his list some of the most renowned producers of Burgundy wines including names such as Armand Rousseau and Georges Roumier. Previously, he has worked as the Head Sommelier in Restaurant Patrick Guilbaud for over 6 years. Today, he also produces with Simon Tyrrell a wine called “Les Deux Cols”, in the region of Cotes du Rhone. Simon Tyrrell has been the owner of Tyrrell and Co. wine importers for the last 10 years and is known as the “Rhone wine specialist” in Ireland. He is also the creator and producer of Craigies cider as well as the co-owner of “Les Deux Cols” project. Charles: I was born in Talence, beside Bordeaux, in the heart of Pessac-Léognan wine region. My mum is from St Estèphe (Bordeaux) and my dad from Givry (Burgundy) but we spent most of my childhood living in Toulouse. Simon: I have been fortunate to have had a very nomadic life. I was born in England but emigrated with my parents when I was only 6 weeks old to Australia. We lived in Sydney until I was 7 before moving on to spend four years in Auckland, New Zealand. We then returned to England where I finished my secondary school education and university. After graduating I spent 5 years living in Paris before returning to live another 3 years in England. I have been living in Ireland for almost 17 years now. My father’s family come from Naas, Co. Kildare and my mother’s from England. Did you always want to become a Sommelier/a Wine Specialist? Charles: I originally wanted to be Chef but during my first stage in a restaurant, the restaurant manager thought I had great potential and convinced me to train as a front house instead of as a chef in the kitchen. From then, I decided that I wanted to pursue my training to become a sommelier and I spent two years in Tain l’Hermitage (Rhone Valley) in a sommelier school. Simon: My family weren’t really wine drinkers although my father was a huge Francophile. I discovered wine when I went to live in Paris. Not speaking French at the time I scoured Paris looking for work in English speaking restaurants and bars and was eventually taken on by the people who run Willi’s Wine Bar (a Paris institution that is still there today). I quite quickly realised that wine was something that I both really enjoyed and that fitted very well with the way my brain works. Up until that point the only other career that had really interested me was journalism. Can you please tell us a little more about your professional background? Charles: After finishing the two years sommelier training program I had to put on hold my carrier for 10 months as the military service was still compulsory in France at that time. I went to Angouleme where I entered the “corps de l’infanterie de marine”…. I walked a lot during these 10 months! 🙂 Then I eventually was finished with it, I worked in a couple of prestigious restaurants to learn from the best: “Michel Sarran”, 2 Michelin-star Restaurant in Toulouse (1 star at the time) and “Le Louis XV”, 3 Michelin-star restaurant in Monaco. In 1999, I decided to find a job abroad to improve my English. An assistant sommelier job was vacant in Restaurant Patrick Guilbaud, I applied for it and got it. I worked there originally for about one year and moved to the K Club where I was assistant sommelier of Didier Fiat. Ten months later, Stephane Robin from Restaurant Patrick Guilbaud contacted me again to ask me if I was interested in the Head Sommelier job as it was about to become vacant. I was thrilled by the opportunity and took it without hesitation. I was really lucky at the time as Stephane trusted me and gave me plenty of resources to build up the number or references on the list. When I left 6 years later, the list had increased from 250 to 800 different wines. It also gave me the opportunity to learn, discover and list some wines from Italy, Spain, Australia, etc which can sound natural nowadays but was quite a novelty for Ireland at the time. Simon: After Willi’s I went to work in a language school before working for a wine distribution company in Paris called Bedhet Valette, a subsidiary of La Societe des Vins de France. I earnt a meagre living, on commission only, by selling cheap wine to cafes and restaurants in the greater Paris region. It taught me huge amount about the need for persistence and structure in selling although it would be difficult to say that I was passionate about the type of wines I was selling. In England I worked for a couple of importers, Balls Brothers in London and C&O Wines in Manchester where I was charged with developing their sales in the North East of England. On arriving in Ireland I went to work for Woodford Bourne as a sales representative covering everything north of a line from the North Side of Dublin to Galway. 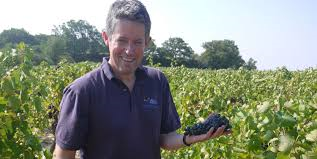 In 2000 I left to set up a new wine importing business, J.S Woods before selling my shares in that business in early 2003 and then starting Tyrrell & Company with my wife Emma. How did you decided to create Nomad wines/Tyrrel Wines & Co.? Charles:I always had a very good relationship with Simon Tyrrell from working in Patrick Guilbaud. Simon always had a passion for Rhone wines and had been importing to Ireland some of the best producers from this part of France. His wines are sourced from just South of Lyon, in the Côte Rôtie area, all the way down to the Luberon. I always loved Burgundy. We both thought that it would make sense to now offer on the Irish market the best of wines from North of Lyon (Beaujolais area) to Auxerre and Chablis. Simon: During my time at J.S Woods I became more and more enthused by my trips to the Rhone and by the winemakers I met there. The partnership in J.S Woods had run its course and I left to fill what I saw as a void that had been left in Rhone Valley imports by the sale of Pat Smith’s Syrah Wines to Barry & Fitzwilliam. I began visiting the Rhone when I first went to live in Paris and fell in love with its easy charm as well as the diversity of its wines. It’s a very different place to do business in comparison to other wine producing regions. There’s none of the formality of Bordeaux nor what I perceive as the rather ‘faux paysan’ air of Burgundy. In the Rhone the person who usually receives you at the cellar door is the same person who tends the vines, makes the wines and sells them. There’s a humility to the Rhone that I find very attractive as well a diversity of geography, geology, wine styles and prices that are to my mind incomparable with the rest of France. Are Burgundy wines easy to sell on the Irish market? Charles: Despite what many people think, Chardonnay does sell very well all around Ireland. Pinot Noir on the other hand, is a grape that is a little more difficult to understand as it is light in body for a red wine and high in acidity. They are wines which are in most cases extremely elegant and subtle and they do not necessarily fit in what the majority of the market is looking for. Another down point for Pinot Noir is its price point. It is a grape that does not accept mediocrity. You can produce entry level Grenache noir for example and it will still be, in most cases, quite appealing because of its fruit characteristics and its smoothness but Pinot noir has to be very good otherwise it can become austere and thin. Its defaults are being magnified much quicker than other grape varieties. As a consequence, it is generally quite expensive. Also, the last few years, Burgundy had seen some terrible hail storms during the growing season and as a consequence some vineyards have been totally destroyed and the crops drastically reduced. However, the quality of whatever was harvested was extremely good and even outstanding in some cases, but the quantities were so small that the prices increased dramatically. What about Rhone wines? I believe your list went through some changes this year? Simon: Certain wines are easier than others. Generic Cotes du Rhone is quite easy to sell as are other appellations such as Crozes-Hermitage, Vacqueyras and Gigondas. 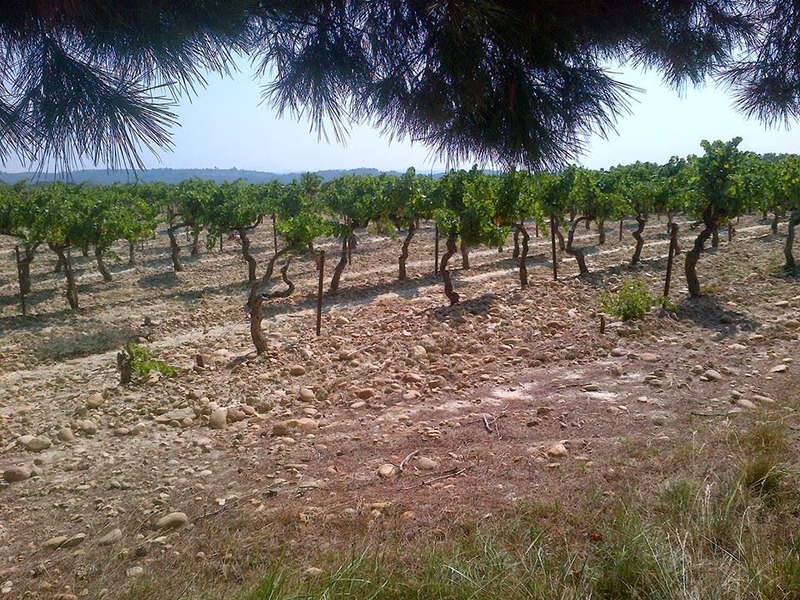 Other well know appellations such as Condrieu, Cote-Rotie or Hermitage have suffered due to the recession whilst Chateauneuf du Pape, in my opinion, is in danger of killing the goose that laid the golden egg with its ever increasing prices. In general the style of Rhone Valley wines suits the Irish palate and climate with the Southern Rhone and its Grenache based wines being particularly appealing. Having spent a few years exploring other wine producing regions, in 2014 I decided to return to my first love and focus almost exclusively on Rhone Valley wines. By this time I had become a producer of both wine and cider and with less time to give over to wine importing I really wanted to be the specialist Rhone importer in Ireland – an importer who people would automatically turn to if they wanted wines from that region. On top of that, as I had started making wine there and was spending an increasing amount of time in the region, it was a logical move. Did you always dream of making wine? Charles Yes, I believe that understanding the “source” of a product like wine is essential. It is beautiful to make wine. I did a few winemaking stages in France as I knew that it was something I would eventually want to do myself someday. Making wine is very technical but also very down to earth. It requires a scientific mind more than a “linguistic” mind. I have never been very good at describing wine in a poetical way. I prefer the Cartesian approach to it. I never wanted to only be someone selling, I always dreamt about creating. Simon: In 2003 I started a project with a Chateauneuf du Pape producer to make a small negociant range of wines in the Southern Rhone and as this activity developed so I started to get more and more interested in the production side. In 2011 I decided to formally cross the line and undertook a 2 year viticulture and oenology course at Plumpton College at the University of Brighton in England. I really underestimated both how I little I knew about the scientific side of wine as well as how much I would enjoy the course! What was the dream when starting “Les Deux Cols” projects? And why this name? Charles: As I said earlier, both Simon and I have a passion for Rhone wines. It is a region that is very well known in Ireland and that produces styles of wine that the Irish market responds well to. We really wanted to produce a wine that was going to appeal to the Irish market and I suppose the idea of it being a Franco-Irish venture is even more exciting. The name comes from the two hills facing Estezargues area. What are the most important things for you when it comes to the style of wine you are looking to produce? Simon: Freshness and balance – these in turn lead to drinkability. Having lived through the period of ‘body builder’ wines I wish never to go back there. Over ripeness, heavy extraction and layers of oak have no place for me in the type of wines I want to make. A Southern Rhone, Grenache based wine can be 14.5% in alcohol but still taste fresh and balanced. For me it’s all about the acidity, the fruit and the extraction. I’m inspired by the wines of Emmanuel Reynaud in the Southern Rhone as well as the many producers in the Northern Rhone and Burgundy. 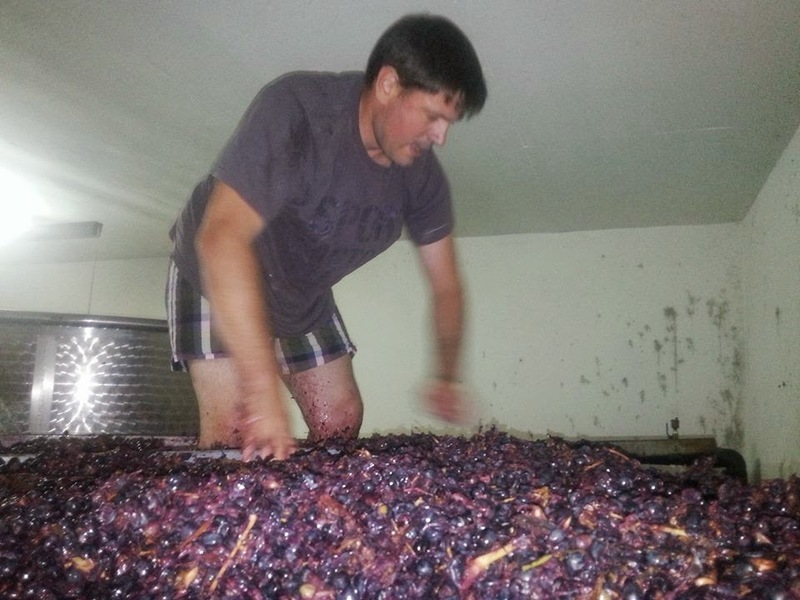 What are the most challenging part of making wine? Charles: All the grapes are hand harvested. Only Simon and I are working during the harvest and often it can feel like we are running a marathon. Not all the grape varieties are harvested at the same time as they don’t all ripen at the same time. 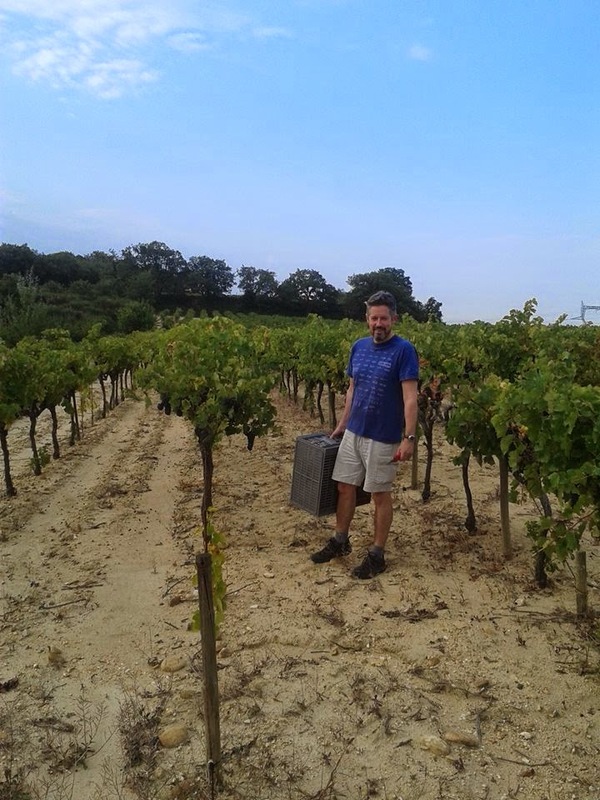 It happens that when one plot is finally harvested and all the grapes finally reach the winery, Simon stays and look after the Vinification to make sure the grapes don’t oxidise while I start harvesting on my own another plot of vineyards. We spend around 2 weeks working in average 15 hours a day in 35°C heat, regularly bitten by wasps, spiders and red ants… that is the most challenging part of making wine! 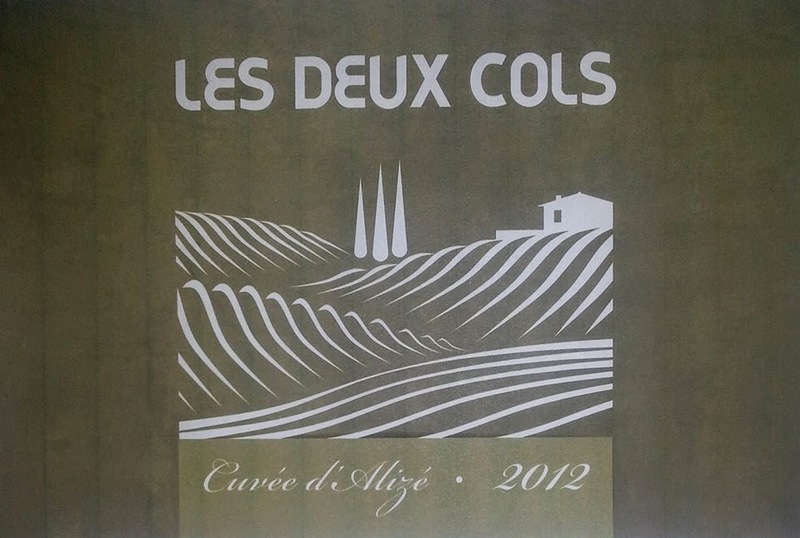 Is Les Deux Cols only for the Irish market or do you sell elsewhere ? You have been producing two different red wines in 2012 and I believe that you have produced this year (2014) a white wine for the first time? Charles: So in 2012 we produced two different red wines. Cote du Rhone “Cuvee d’Alizée” made from a blend of Grenache (55%), Syrah (35%) and Cinsault (10%). The other wine which was produced in very small quantities is called “Cuvee Serine” and is made with only Syrah grapes. 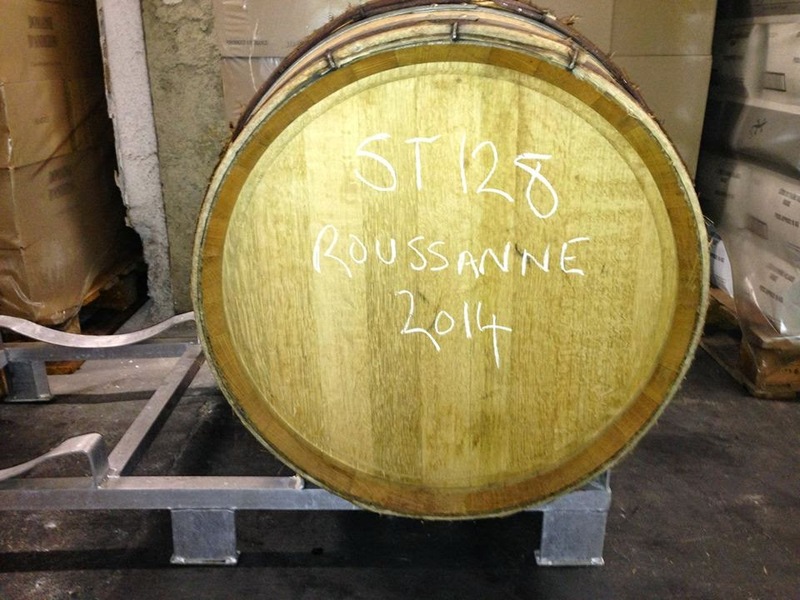 2013 was a difficult vintage: the harvest was pretty small but of exceptional quality. 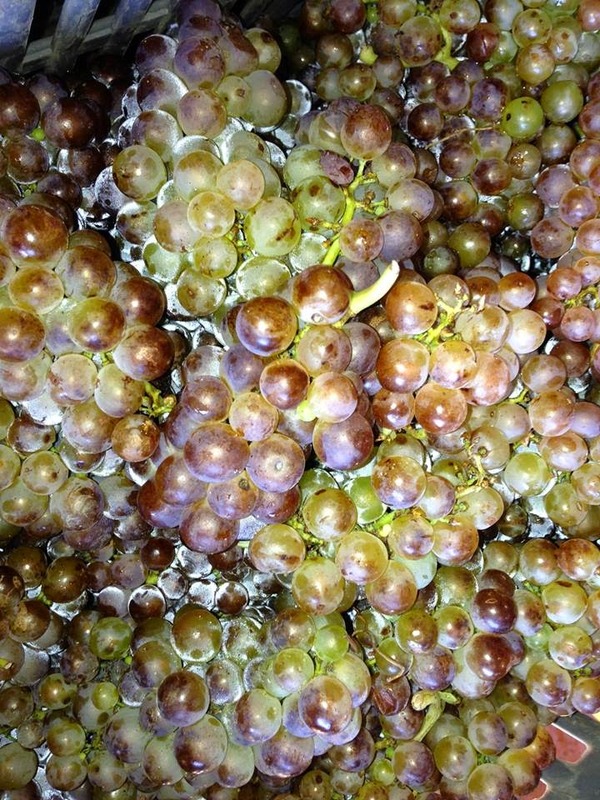 As a consequence we only produced “Cuvee Alizee” as we did not have enough grapes to produce “Cuvee Serine”. 2013 is just on the market now, watch out for it as it is delicious! Simon : The white wine is made from 100% Roussanne form a vineyard within the commune of Rochefort du Gard. The grower works his vines organically and the parcel of vineyard faces east and we were really delighted by the freshness of the juice. We fermented part of it in tank and part in barrel and we’ll have to let you know how it turns out and it hasn’t done its malolactic fermentation yet. How would you describe Cuvee Alizee 2013? Could you recommend a wine pairing ? Charles: It is has a pure and very appealing nose with aromas of black cherry and liquorice. On the palate it is round, juicy, friendly with a beautiful aromatic freshness and drinkability. The alcohol is very well integrated. I would recommend to serve it at around 16°C with a traditional recipe from Provence called “agneau de 7 heures” which is a 7 hours slow cooked lamb dish with wild herbs flavours. Simon: Cuvee d’Alizé can be bought in off licences and wine shops such as Jus de Vine, 64 Wine, Donnybrook Fair, and the Drinks Store. It’s also available in a number of restaurants around the country. Cuvee Serine 2012 was only sold to restaurants and we didn’t make any in 2013. We made quite a lot more however in 2014 and so we should be able to get some out into the off trade. Nowadays, most of us are conscious about fitting into a budget when it comes to anything, including wine. What do you think are the bestvalue for money wines on your list at the moment and where can we buy them? Charles: I would definitely encourage people to taste the Bourgogne Aligoté from Domaine Goisot. (Biodynamic) It is a perfect wine for the aperitif but also to have during the meal with some white fish. It retails approximatively at €17 and Donnybrook Fair and Sheridans are currently stocking it. Another producer to watch out for is Domaine Ponsot in Rully who produces some beautiful white and red wines. The price point starts at around €22 on the shelf but it taste as some good as some Puligny-Montrachet. Thank you very much to Simon and to Charles for taking the time to answer my questions. Their passion clearly confirms that despite challenges in recent years, the future for the Irish wine industry is in good hands. Let’s keep on tasting, discovering and sharing !